Hey hey! 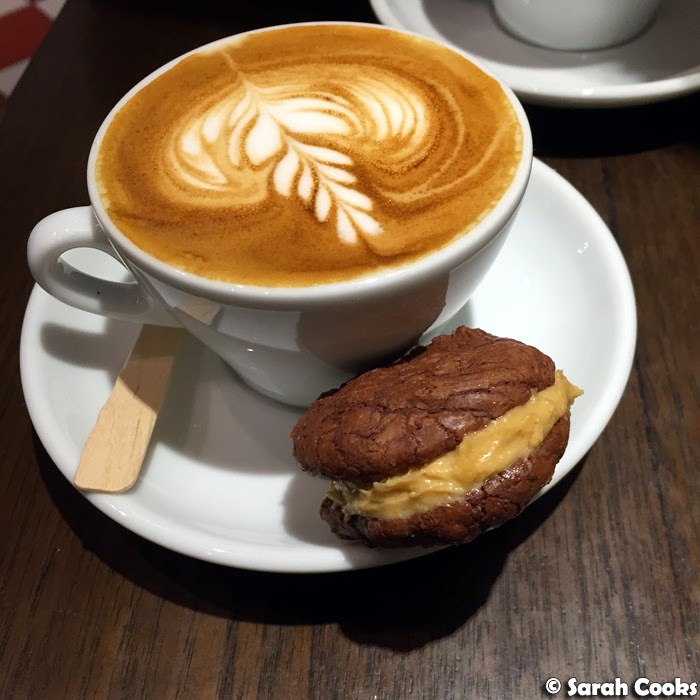 So, I'm pretty obsessed with those fab Butterbing chocolate and peanut butter cookie sandwiches that have been popping up in fancy cafes around town. (I've bought them from Little Rogue and Bonnie Coffee Brewers before, but you can see current stockists at Butterbing's website). They do make other flavours, but I'm all about the peanut-butter-filled! Well, the other day I saw a recipe for very similar looking cookie sandwiches on Donna Hay's Instagram and I just had to try it! 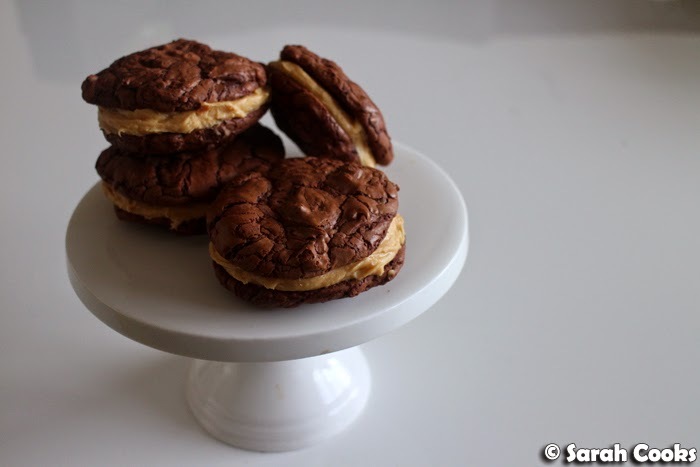 These biscuits are very rich and chocolatey - the recipe makes 12 cookie sandwiches, and uses a whopping 350 grams of dark chocolate. Yes please! Most cookie recipes I've made before (i.e. standard chocolate chip cookies), are based on a creamed butter-sugar mixture, with eggs, flour, leavenings and chocolate chips mixed through. However, this recipe has you start by whisking eggs and sugar vigorously until super pale and tripled in volume, before adding in melted chocolate and butter, a tiny amount of flour and baking powder to hold it together, and more chocolate pieces. I believe it's the aerated egg-sugar mixture that gives the crackly appearance, with the air making the cookies rise and fall as they bake. 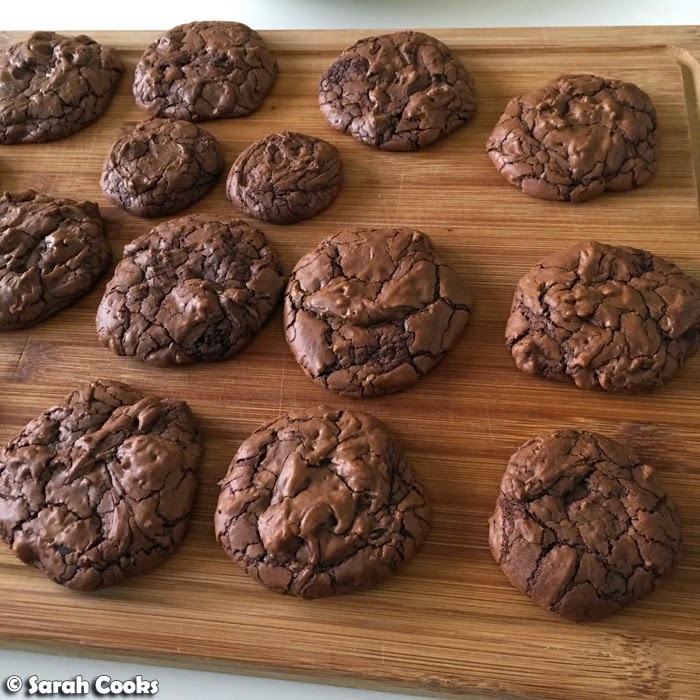 Obviously, it's the shedload of melted chocolate gives the cookies their rich gooeyness. Yum. The frosting is super easy to make - just beat together icing sugar, peanut butter, softened butter, vanilla extract and a little cream. It is so ridiculously delicious! I found I only needed about two thirds of the icing to fill all the cookies, so there was heaps leftover for snacking purposes. I may have eaten most of it, silently, in the kitchen, whilst "doing the dishes". Whoops. The frosting was quite sweet, so I sprinkled a little fleur de sel on the icing before sandwiching the cookies together, to balance out the flavours. It was a good move. I think the frosting would be good on other biscuits, cookies, brownies or cakes too. Any ideas, people? I totally loved them! Probably a good idea that I gave most of them away, otherwise I would have seriously eaten them all. So much rich chocolatey peanut buttery goodness! As you can imagine, these go really well with a nice strong coffee. A sneaky one for me! Obviously mine weren't as perfect looking as the Butterbing ones, but they were still super tasty! They're really rich, so next time I might actually make them smaller. (The recipe below makes the big ones you see in my photos!) Either way, it was a fun and rewarding little baking project. Hooray! To make the cookies, preheat the oven to 180C. 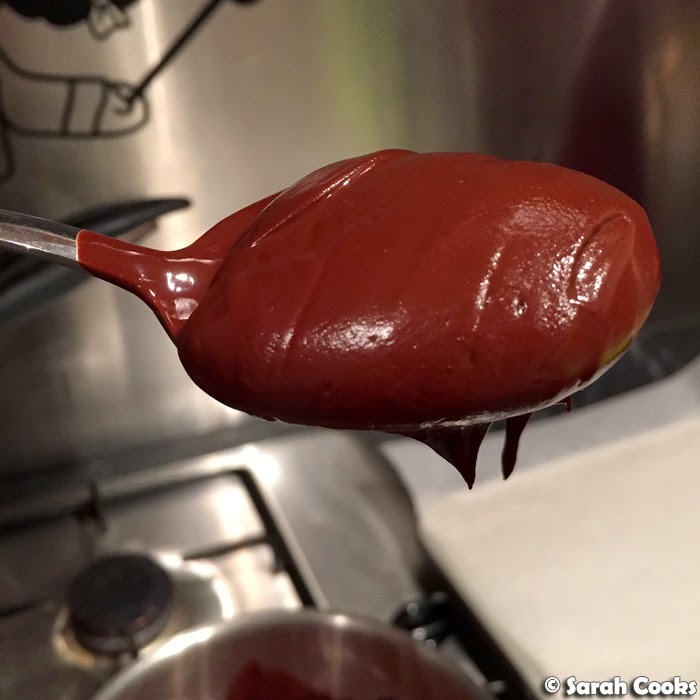 Place 200 grams of the chocolate and the butter in a heavy-based saucepan, and melt over a low heat until smooth, stirring occasionally. Set aside. Place the eggs, caster sugar and vanilla extract in the bowl of a free-standing mixer, and whisk on high for 10-15 minutes, or until pale and creamy, and tripled in volume. Sift over the flour and baking powder. Fold in gently using a large metal spoon. Add the melted chocolate and butter mixture, and the remaining chopped chocolate, and fold in gently until combined. Allow the mixture to sit for 10 minutes. Drop tablespoons of the mixture onto lined baking trays, allowing room for spreading. Bake for 8-10 minutes, or until puffed and cracked. Allow to cool completely on the baking sheets. 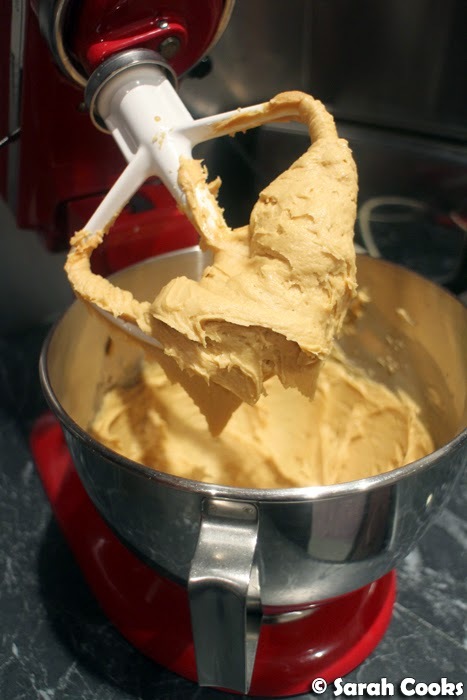 To make the frosting, place the icing sugar, peanut butter, butter and vanilla extract in the bowl of an electric mixer, and beat for 5-6 minutes or until well combined and fluffy. Pour in the cream and beat for a further 2 minutes. 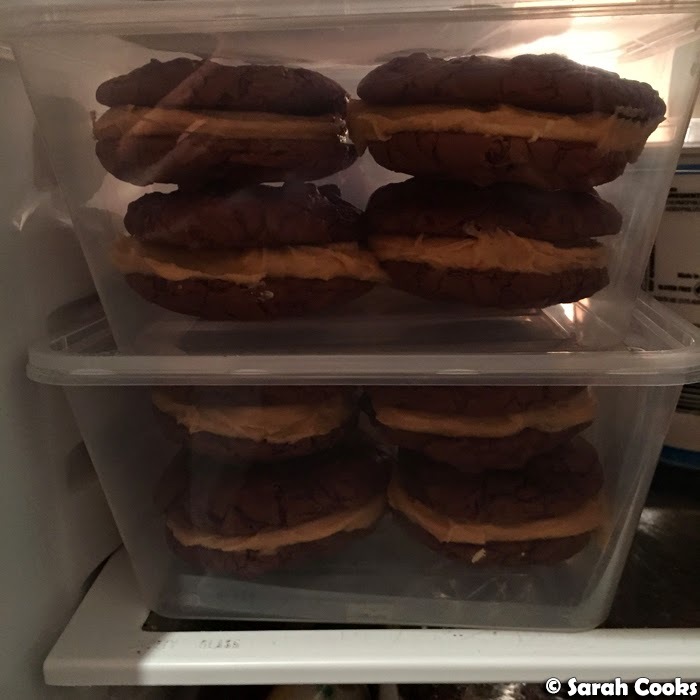 Spread half the cookies with the peanut butter frosting, sprinkle each with a little fleur de sel, and sandwich with the remaining cookies. (You may have some leftover icing - don't fret, just eat, gratefully). Makes 10-12 sandwich cookies, depending on the size of your cookies. I've gotta try this recipe and the salted peanut butter frosting soon!!! It looks so good! how did these compare to Butterbing cookie part, taste and texture wise? I love these! I can definitely eat a whole bunch of these. But that would be too sweet, right? :)) I will love to pair it with coffee too! Chocolate and peanut butter! Can't wait to try this recipe. Looks great. Could you use GF flour? I haven't personally tried it with GF flour so I can't verify, but with such a small amount of flour in the batter I think it would be worth trying! from memory the butterbing cookies are gluten free so I'm going to try with GF flour. thanks for the recipe!